"Wake up up, well more assessed, somewhat more convey-largely, a little stretched Ruede with sloping croup. The angles of the first option are perfectly, the chest relationship are addressing and the upside-down position straight. In the front foot root joint the Ruede shows easy weakness. It has strong clubs and much bone strength. Good nature and pronounced combat impulse are own to it." "...the breeders did not like this line. They felt there was weakness in the temperament of these dogs...The breeders managed to pressure the S.V into introducing the "Test of Courage". 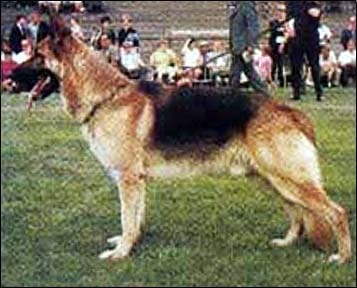 The first year the test was introduced, Zibu son, Dido Werther Konigsallee (Slated to be Sieger) failed, as did a number of other prominent stud dogs. Even though Dido managed to get through the test the second year and was made Sieger at that time, both he and Zibu were soon absent from the winning lines, - and the Sieger Show. "